My family has spent a lot of time away from home these past few weeks. Between visiting my sister in Wyoming and spending time with my in-laws, it feels like I’ve hardly been home. Something about those long drives in the car – people get hungry, especially little children. I’ve been wondering what healthy snacks I could bring on the road for my little family to eat. Growing up, our snacks on road trips to California and Colorado consisted of Oreos, Chips Ahoy, Sprite, and some apples. However, the apples were soon taken away at the California border. After taking a few vacations with my little family, I see why my parents usually went with the packaged cookies. There is a lot of stress that can go into packing for a trip! Between making sure everyone has enough clothes, toothbrushes, packing the car, and making sure the house is clean, packaged snacks are a quick thing to just grab and go! With little children, I naturally have to do a little prep before they can eat some of these. I keep an apple slicer, a plastic knife, and a grocery sack for a trash bag near me while we are traveling. Josh is behind the wheel, and I’m behind the snacks! I’m not saying that you shouldn’t take cookies or other snacks at all. Just try to be aware of how much you and everyone else is eating. On the way back from Wyoming, I let the kids each choose one snack pack that they could take with them to eat. After they were finished eating them, though, I looked at the calories and sugar in the snack packs and said “Never again.” I would rather take one package of cookies and just hand them out one at a time. That way I have control over how much they are eating. Hopefully you have some ideas for the next time your headed for a long car drive. 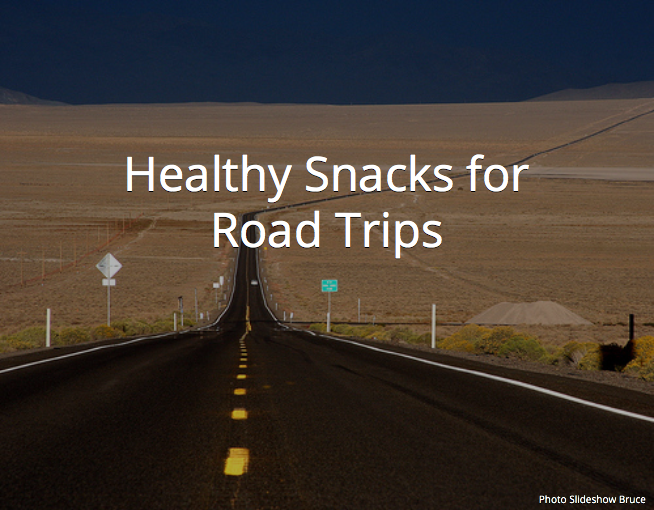 Eating healthy snacks on road trips is possible, it just takes a little planning. The most important thing, however, is to have fun and enjoy the time with your family!